Chesapeake Financial, LLC is one of the leading financial services providers in the Maryland, DC, and Northern Virginia area, offering a comprehensive portfolio of financial services to a thriving small business community. Their mission is to provide cost effective and innovative solutions to all your financial needs, whereby allowing you to focus on what matters most...growing your business. Their greatest strength is understanding your business, and our team is motivated to deliver solutions that quickly maximize your time by minimizing your bookkeeping burden. Right from the start, using their Client Assessment, they will gain an in-depth understanding of your company's current accounting policies and procedures, and will work with you to determine the services your organization needs. Guide Chesapeake Financial, LLC in promoting themselves and growing their book of business and recruiting clients by launching their company branding, digital presence, social media campaign, and print materials. Design a logo that speaks to the industry and prospective clients Chesapeake Financial is trying to capture. Create a visually appealing website describing the services Chesapeake Financial could provide for clients, general company information, and online applications for all interested individuals. Set up appropriate social media pages, with consistent messaging and imagery. 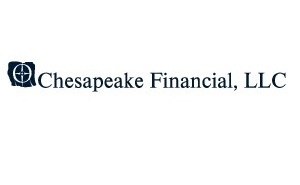 Draft and design Chesapeake Financial's business cards, email signatures, and letterhead for clear brand identity. The Chesapeake Financial logo was created to reflect the idea of the stability of a major corporation, while still being an approachable neighborhood business. We built ChesapeakeFinancialLLC.com, a website that provided prospective clients a centralized location for submitting their inquiries, as well as information about the company. We also created Facebook, LinkedIn, Google business and Yelp pages for Chesapeake Financial, which allowed their online presence to rapidly grow and increase their search engine optimization. For in-person recruitment and online postings, we designed branded business cards, email signatures, and letterhead that provided consistent branding when networking, or contacting clients.